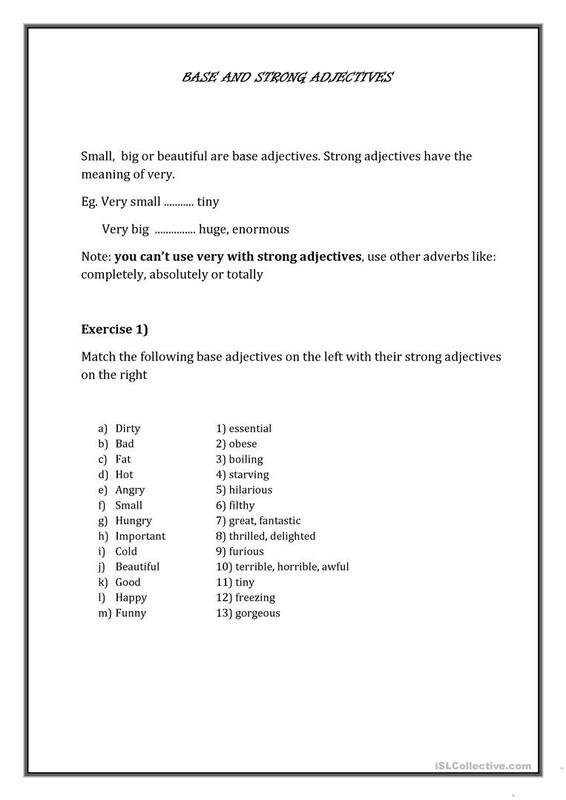 There is a brief explanation followed by two exercices, In the first one, SS are asked to match the base adjective with the corresponding strong one. In the second they have to fill in the gaps with a strong adjective. KEY is included. I really hope you like it! This downloadable teaching material was created for business/professional students, high school students and adults at Pre-intermediate (A2), Intermediate (B1), Upper-intermediate (B2), Advanced (C1) and Proficient (C2) level. It is aimed at consolidating Adjectives in English, and is a valuable material for working on your groups' Writing skills. The exercises come with a key.